In Yoga for Kids Part 1, I went over important information on how to teach kids yoga. In that article, we discussed the guidelines and benefits of doing kids yoga, and also talked about several useful techniques for getting children to learn and practice yoga. Finally, I detailed some standing kids yoga poses, which were demonstrated by my son Shivum. In part 2 of this series, I am going to give you tons more kids yoga poses, along with their overall benefits, which you can use to design your own yoga sets for children. 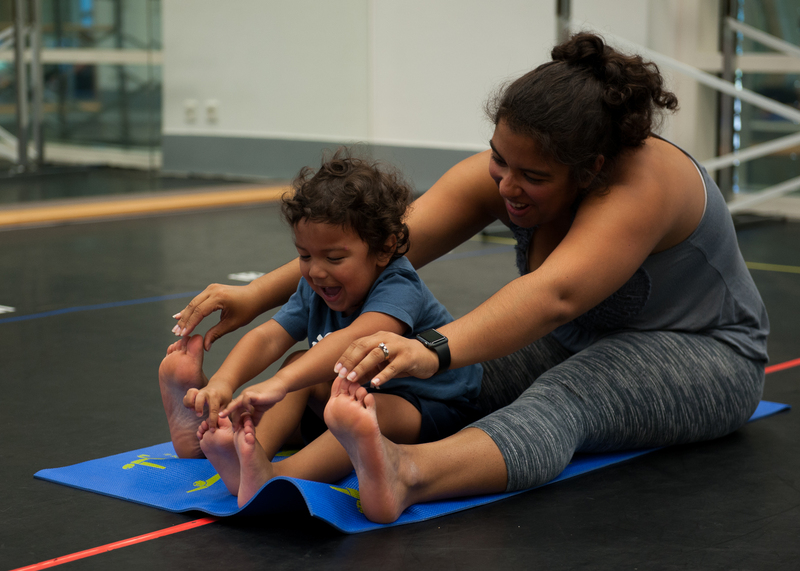 Also, please note that all these kids yoga poses are great for adults too , and give the same benefits to you as they do for the little ones. So feel free to include them into your daily yoga practice as well. A great way for to encourage kids to do yoga and meditation, is by showing them other children enjoying and doing that practice. That is the primary reason for having Shivum demonstrate the kids yoga poses for this series. You can find his demonstrations of kids meditations in the following article: 3 Easy Kids Meditation Techniques with Videos. Yoga rock-n-roll is a great way to warm-up. It can also be used in between exercises, to go from positions done on one’s back to other positions which require one to sit or stand. Good for the back, spine and distribution of blood and energy throughout the system. Very good for adults too. This exercise almost always finds a way into my personal sets. Want to fee humble? Want to feel devotional? Want to show respect? Bow. Bowing is an integral part of Zen Buddhism and of course, all other traditions as well. It just shows adoration, love and respect for the higher powers in life. Yoga Bowing Pose below, perfectly encompasses this attitude. Also, useful when the Knight meets the King . The pose to rest and relax in. Anytime you feel you have overdone it and need a break, assume baby pose and relax. It calms the mind and soothes the nervous system. Great way to warm-up and get started is by doing yoga shoulder shrugs. It is also a great way to release stress. You can encourage kids to use this exercise anytime they feel overwhelmed by too much stress or tension. Inhale up and exhale powerfully as you lower your shoulders. The starting position and ending position of this exercise are illustrated below. This is a great kundalini yoga exercise. It will strengthen the child’s arms, shoulders, chest and legs. It will also release the hips and promote flexibility in the hip joint, which is most important to avoid injuries. The kids, of course, love crawling around like a bear. Two illustrations are below for this exercise. Yoga bridge pose if a part of the very popular Kundalini Yoga Morning Wake-up Series, which is part of the Free Online Introduction to Yoga & Meditation course here on Mastery of Meditation and Yoga. Bridge pose is excellent for the immune system and also, builds leg, arm, shoulder, and back strength. Cobra is an excellent yoga pose which is part of all schools of yoga. It is very good for flexibility and your back. You can get lots more details about this pose from the following chapter of the Free Online Hatha Yoga Poses E-book: Cobra Pose for Healthy Back and More. This kundalini and hatha yoga exercise is an integral part of many abdominal yoga sets. You will find it in the following set Excellent Ab Yoga Set for Shaping Stomach. It is great for building core strength and good for their little digestive systems as well. Well you can just imagine the fun kids have in doing these two poses below. Adults ought to do them to. It will help you break free of your inhibitions and is a great way to detox as well. In the second pose below, have them roar like a lion. In the first pose, have them stick their tongue out as far as they can. Here is Shivum doing a variation of plank pose, also sometimes considered a variation of bridge pose. It has similar benefits to forward plank pose, which I demonstrated in the Free Online Kundalini Yoga Exercises E-book, in the following chapter Yoga Plank Pose. Here is another kundalini yoga exercise that the kids absolutely love to do. Punch, punch punch. Encourage them to use this exercise to break through and conquer their fears. Have them breath out forcefully as they punch out with alternating hands. Sure why not? 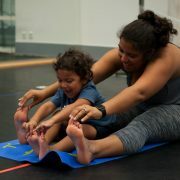 Like I mentioned, yoga with kids should be open and fun, so allow them to incorporate things they love into their practice. Here shivum is doing Spiderman, which is actually a pretty hard pose to do, and is great for opening up the groin and promoting flexibility. If they want to incorporate Dora the Explorer, Thomas the Train or Lightening McQueen into their practice, find creative ways to do so. It will help your creativity and make doing yoga more fun for them. That is just the little yogi of the family, Taran, taking a self made bath, after a tough yoga practice. . These two kids yoga articles should give you plenty of information as well as poses to get your children started on yoga. In the future, I will continue to provide more information, as well as more yoga and meditation techniques to help you raise exceptional children.